Ben Affleck was in the news recently for something other than the movie business. A few days back the actor admitted to counting cards at a casino in Las Vegas. In May earlier this year, tabloids were abuzz with the news that Ben Affleck was asked to stop playing the game of blackjack because he was really doing well at it and winning a lot. 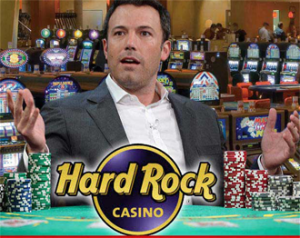 The incident happened at the Hard Rock Casino where security guards came to the table where Affleck was playing and winning at blackjack and asked him to stop. This became big news for the obvious reasons as he is Ben Affleck – the big Hollywood actor, producer and director. The earlier incident was accompanied with a lot of hearsay. Some news agencies reported that he was asked to leave the casino, which the actor says isn’t true. He has refuted this by saying that he was just asked to not play blackjack. He also said that the casino asked him to enjoy the casino and try his hand at other games like roulette or craps. But he admits that the casino in question did alert other casino about his good blackjack skills. The news gathered steam again a few days back when Ben Affleck admitted that he indeed was counting cards at the casino where the incident occurred. He has been quoted as saying that he took time to learn the nuances of blackjack and to really understand the game. He also expressed his exasperation at the fact that casinos do not allow anyone to win at the games. Once a player starts winning; the casinos make sure that a player is not playing the game anymore. He has said that it really shows how the casino business works when the casinos only want you to spend the money but not win. When admitting to card counting at blackjack, he also refuted the rumours that his wife; the actress Jennifer Garner; is very angry and upset because of his gambling addiction, which he says are not true at all.